No Wasted Time: Let us do the work for you. We can quickly find reputable sprinkler system companies in your area. No Uninformed Decisions: You will receive access to sprinkler system company reviews. Most homeowners will spend between $50 and $125 to have their sprinkler system winterized by a professional. The national average reported cost is $81. The minimum cost a homeowner paid was $40 while the maximum reported cost was $250. An irrigation system is a major investment, so the last thing you want to do is destroy the system by failing to prepare it for winter. If you live in an area where temperatures reach freezing, winterizing is non-negotiable. The manual drain valve method is used when there are manual drain valves at the low and end points of the piping. Shut off the system’s water supply and carefully open all the manual drain valves. When the mainline is clear of water, disassemble the valves to remove any standing water. You may also need to drain water from the sprinklers themselves. The automatic drain method is used when automatic valves exist instead of manual valves on sprinkler heads and lateral pipes (but not the main line - this is always drained manually). These will automatically activate when the system is shut off. Even with an automatic drain system, it is still a good idea to check for puddling on the surface of the soil, which could mean that one of the drains is stuck open. You should also disassemble the valves to remove standing water. The compressed air or blow-out method involves using an air compressor to clear all water from the main pipe, control valves and sprinkler heads. This service is offered by many professional irrigation services, but some people decide to tackle the job themselves. The blow-out method can be used with either manual or automatic systems, and it’s the best option if you don’t know what type of system you have. If you’re comfortable with all the terminology above and you feel confident that you can properly winterize the irrigation system, go for it. You’ll save money and the project will be completed on your time schedule. However, keep in mind that there are some dangers. For example, manual drain valves and caps are pressurized, so they can lead to injury if opened too quickly. Always wear eye protection just in case and follow OSHA guidelines for safety when working with compressed air. Below is a how-to video that should be reviewed before beginning your DIY project. If you don’t know the difference between a main line and a valve (which is perfectly OK! ), winterizing is best left to the pros. The job usually costs anywhere from $75 to $250, depending on the size of your system, its configuration and local labor rates. Keep in mind, however, that you’ll have to pay about the same amount to have the system reactivated in the spring. Here is a video that explains how to blow out your system yourself. If you’re planning to hire a professional, seek multiple quotes to compare prices. Look for a company that guarantees its work, and perhaps one that offers a discount for signing a multi-year contract (if you’re willing). Always ask for references and check the company’s rating with the Better Business Bureau. Finally, ask for proof that the company has current liability insurance. If not, you could be financially responsible for any accidents that occur on your property. 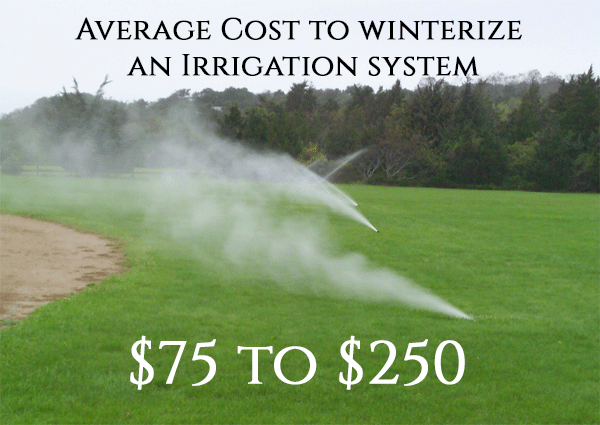 Heres a good one "Winterization Cost"
Do You Need a Sprinkler Winterization Pro Near You?